Washington, D.C. – U.S. 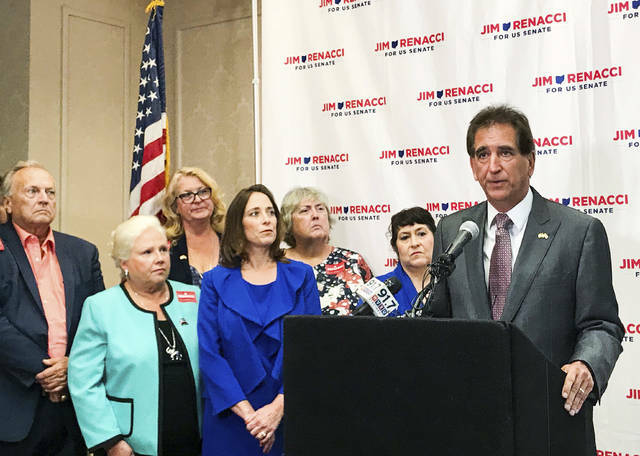 Term Limits (USTL), the leader in the nonpartisan, national movement to limit terms for elected officials, today praised Ohio U.S. Senate candidate, Jim Renacci, for signing its congressional term limits pledge. The U.S. Term Limits Amendment Pledge is provided to every announced candidate for federal office. It reads, “I pledge that as a member of Congress I will cosponsor and vote for the U.S. Term Limits amendment of three (3) House terms and two (2) Senate terms and no longer limit.” The U.S. Term Limits Constitutional Amendment has been introduced in both the U.S. Senate by Senator Ted Cruz (SJR2) and the House of Representatives by Representative Ron DeSantis (HJR6). U.S. Term Limits is the largest, grassroots term limits, non-partisan advocacy group in the country. It seeks to impose term limits on elected officials at all levels of government, particularly on the U.S. Congress through an amendment to the U.S. Constitution. Find out more at termlimits.org. COLUMBUS, OH – During the first quarter of 2018, Ohio’s horizontal shale wells produced 3,942,251 barrels of oil and 531,291,017 Mcf (531 billion cubic feet) of natural gas, according to the figures released today by the Ohio Department of Natural Resources (ODNR). Natural gas production from the first quarter of 2018 showed a 42.85 percent increase over the first quarter of 2017, while oil production decreased by 3.6 percent for the same period. • The average amount of oil produced was 2,066 barrels. • The average amount of natural gas produced was 278,454 Mcf. • The average number of third quarter days in production was 86. Ohio law does not require the separate reporting of Natural Gas Liquids (NGLs) or condensate. Oil and gas reporting totals listed on the report include NGLs and condensate. (Columbus – July 11, 2018) The Mid-Ohio Regional Planning Commission (MORPC) is pleased to announce Hwa-yuan (Brian) Shang as the new information technology (IT) director. MORPC Information Technology Director will oversee the development, implementation, and use of technology throughout the agency, proactively addressing organizational, departmental and user-based needs. Areas of responsibility include the full range of information systems and telecommunications activities, including determining user requirements, recommending practical solutions, and leading agency-wide efforts to improve the effective use of technology. Responsible for developing and maintaining the technology strategic direction and IT plan for the agency. Shang brings experience in leading IT projects and teams, developing program values with collaboration. He mostly recently served as Information Technology Manager for Franklin County Emergency Management and Homeland Security where he oversaw IT operation, developed an IT strategic plan, adopted technology solutions to realize agency missions and objectives and lead projects that included system and component upgrades, server administration, data quality assessment, application development and procuring. “It is my great pleasure to accept this challenge and I will learn the intricacy of each requirement, transform it into technical deliverable, and then I will make sure Information Technology is earnestly engaged with MORPC at all levels,” Shang said. Shang is a PhD candidate, City and Regional Planning, at The Ohio State University, received his Master in Landscape Architecture, University of Pennsylvania, Master in Regional Planning, University of Pennsylvania, and B.S., in Landscape Architecture, Tunghai University, Taiwan. Friends of the Drexel today announced that Jeremy Henthorn has been selected as theatre director of the Drexel Theatre. Currently executive director of the Columbus International Film and Animation Festival at the Columbus College of Art and Design and a resident of Bexley, Henthorn holds a Master of Fine Arts from the University of Southern California’s School of Cinematic Arts, ranked No. 1 on The Hollywood Reporter’s list of Top 25 Film Schools for five years straight (2013-17). He will begin his new role with the Drexel on Monday, July 16, 2018. For generations, the Drexel Theatre has been central Ohio’s first source for independent film and the best of Hollywood and international cinema. As theatre director, Henthorn will oversee the theatre’s day-to-day operations, determine artistic content, book and promote films, program theatre activities and special events, and serve as community ambassador for the Drexel. COLUMBUS, OH – A 20-person Ohio wildfire crew from the Ohio Department of Natural Resources (ODNR) left on Friday, July 6, to travel to Boise, Idaho. From there they were assigned to the Dollar Ridge Fire in northeastern Utah. Additionally, an ODNR wildfire crew consisting of three people and one wildfire engine left Ohio on Friday to assist wildfire suppression efforts in Sweetwater, Texas. The ODNR Division of Forestry trains ODNR, federal and private natural resource agencies, as well as fire department personnel from across the state, for inter-agency wildland fire detail and emergencies to protect life and property in Ohio; manage prescribed fire for forest regeneration; and to provide assistance to other states as part of the national effort. Ohio crews and individual management personnel have assisted with hurricanes, floods and wildfire incidents since 1986. Crews and overhead staff are normally dispatched out-of-state for two-week assignments. Travel and wage costs are reimbursed by requesting agencies. Last year, Ohio’s wildfire and engine crews responded to southern wildfire assignments in Georgia, Arizona, New Mexico and Montana. The ODNR Division of Forestry also coordinates agreements and wildfire training, prevention, suppression and enforcement with 325 fire departments in the southern and eastern parts of the state and around Maumee State Forest in the state’s northwest corner. COLUMBUS, OH—Today Indivisible: Ohio District 12 held two events to help drive early voting for Democratic candidate Danny O’Connor in the special election for the OH-12 U.S. Congressional District. Scores of voters turned out in Delaware and Franklin counties to vote, meet Danny, and cheer him on. In this election, registered voters are selecting a representative to finish the Congressional term of Pat Tiberi, who left his position in January. The special election will be held on Tuesday, August 7, but beginning today, July 10, citizens may vote early at their county board of elections. Voters may also choose to cast an absentee ballot by mail. Voters will cast ballots again on Tuesday, November 6, 2018, to determine which candidate represents OH-12 for the next two-year Congressional term.